The 10 Best Ice Cream Parlors in Wisconsin! With its rich history in the dairy industry, Wisconsin’s milk, cheese, and everyone’s favorite, ice cream, are among the very best in the country. From large chains that have busted through the barriers of Wisconsin to small mom and pop shops down the street, ice cream is a hot commodity. 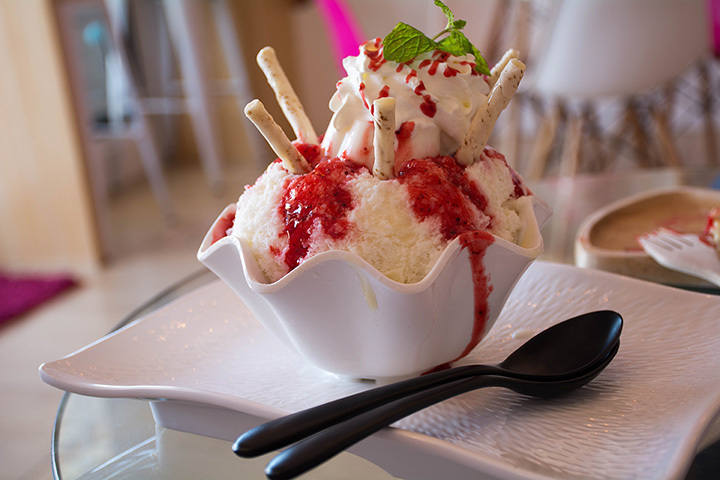 Here are the 10 best ice cream parlors in the state! The famous Culver’s restaurant and brand was created right here in Wisconsin. On top of their great fast food, they offer the best frozen custard. They have recently expanded and are in a number of locations throughout the Midwest. Enjoy your free scoop of custard with a purchase of a kid’s meal. The Babcock Hall Dairy Store offers tons of ice cream options available for purchase. This is conveniently located the University of Wisconsin campus but is open for the public to enjoy as well. Enjoy the sweet treat of over 15 Babcock ice cream flavors. Let the cute colorful subway tiles at the Purple Door Ice Cream shop take you back to being a kid again. They have tons of ice cream flavors and dishes for purchase. From root beer floats, to banana splits and your favorite sundae treats. Enjoy the downtown Milwaukee experience by stopping into Purple Door Ice Cream. After generations, the Kelley Country Creamery has been scooping up old-fashioned premium ice cream in the Fox Valley area. Top notch local ingredients combined with the farm fresh non-homogenized milk from their cows brings you the ice cream you know and love. Check out all their flavors online before heading out to the farm—you’ll shocked how lengthy the list is. Homemade ice cream, sundaes, waffle cones, malts, and more! Pearl Ice Cream Parlor in La Crosse is a favored little 1930s shop located on none other than Pearl Street. Enjoy their seasonal flavors along with their traditional favorites loved by all the locals. The Door County Ice Cream Factory is the Door County’s most loved, old-school ice cream shop. Try their seasonal and limited edition flavors on top of their extensive premium ice cream flavors. Read about the fun history behind the shop and its owner and find out why so many locals and tourists stop at the Door County Ice Cream Factory. Zesty’s Frozen Custard chain in the Fox Valley has earned “Best of the Bay” for six years straight. They offer fresh homemade frozen custard along with a full fast food menu. Take your custard in a dish, cake cone, or waffle cone. Then decide between single, double, triple, or quad stacked frozen custard. Lauber’s Old Fashioned Ice Cream is nothing short of its name. Step back in time in their old-school shop offering an authentic 1920s ice cream parlor vibe, a jukebox, candy counter, and let’s not forget their tasty ice cream. Four whole pages of ice cream treats await your arrival at Lauber’s. The Dairy Cove is a small ice cream and eatery located off Highway 22 in Cecil, Wisconsin. Make sure to catch them in late spring, summer, and early fall before their close. Browse tons of ice cream options along with other snacks for purchase. Don’t forget to pop a squat on their over-sized lawn chair for fun pictures. Briq’s is a family-operated chain serving ice cream, sundaes, and other specialty treats since 1985. Check out their famous soft-serve ice cream and foods made from the freshest ingredients. If you are a real soft serve lover, you’ll take on the “One Pound Cone Challenge.” Finishers get free ice cream for two days each summer…for the rest of their lives!